A surfboard is so much more than platform for wave riding. It’s a common symbol of beach and coastal culture worldwide. Surfing exists in many different countries and surf culture varies on location, but one common denominator is held sacred among surfers internationally: all surfers love and cherish the ocean. A well-known surf organization, The Surfrider Foundation states that their mission is to “to protect and enjoy or oceans, waves, and beaches”. Ironically, however, the bulk of the chemical materials used in manufacturing surfboards are derivatives of benzene, a material that is most commonly produced from raw petroleum. From harvesting to refinement, petroleum is unsustainable and even harmful to the earth in general, especially oceans. Although the materials necessary to produce a surfboard aren’t sustainable, many well-maintained surfboards are functional for years and are often up cycled at the end of their functional lifespan, resulting in an product that has an ecologically unstable start but potential for an virtually unlimited lifespan. Although there are unlimited sizes and shapes of surfboards, most modern surfboards are constructed using the same materials and techniques (with the exclusion of beginner soft-top boards and specialty wooden boards). Surfboards contain a foam core constructed of polyurethane or polystyrene with a small strip of wood running through the foam lengthwise, known as the “stringer”. This foam core is wrapped in multiple layers of epoxy resin and fiberglass. Both polyurethane and polystyrene are chemicals synthesized from benzene, a petroleum product. Benzene can be formed through numerous chemical transformations, but almost all stem from the distillation of oil. “About half of the benzene that is manufactured is used to produce ethylbenzene, which in turn is used to make poly(phenylethene) (polystyrene)”. ("Benzene and Methylbenzenes”). Ethylbenzene is formed from the reaction between pressurized ethylene (another petroleum product) and purified benzene with the presence of zeolite catalyst that is commonly found in volcanic rock. Although ethylene and benzene are both petroleum products, the naturally occurring catalyst only acts a recyclable accelerant that is reused again and again for chemical production. The ethylbenzene vapor is then passed over a heated metal oxide catalyst, which produced hydrogen gas and the final product: polystyrene. Polystyrene is commonly used as “Styrofoam”, and the chemical waste from production is incredibly harmful to the environment. “A 1986 EPA report on solid waste named the polystyrene manufacturing process as the 5th largest creator of hazardous waste.· The National Bureau of Standards Center for Fire Research identified 57 chemical byproducts released during the combustion of polystyrene foam. The process of making polystyrene pollutes the air and creates large amounts of liquid and solid waste”. ("Polystyrene Foam Report."). Polyurethane has an even more intensive chemical process: It starts with a compound form of benzene, methylbenzene, which is also commonly known as toluene. It has to undergo a series of reactions with nitric acid, sulfuric acid, chlorobenzene, water, and other chemicals in a chemically complicated production process involving multiple reductions. Polyurethane foam is commonly used in home insulation in spray form and is generally seen as a more ecologically friendly alternative to polystyrene. However, it is harder to shape into blanks and is softer, making it more susceptible to water and pressure damage. Unfortunately these drawbacks prevent many local surfboard shapers from using it over polystyrene. Although the foam component of surfboards is composed of unsustainable materials and produces toxic chemical byproducts, the materials of the “stringer” of the board are relatively sustainable. The stringer is the small strip of wood running through the foam lengthwise that serves to give the board a degree of flexibility. Although any lightweight wood could easily be utilized in the stringer, raw balsa wood is the traditional choice because of its low density. It’s incredibly buoyant and works well with glue and epoxy. Additionally, like bamboo, it’s a fast growing wood that can be harvested frequently without depleting it as a resource. However, the inclusion of a very small amount of an ecologically friendly and sustainable material does very little to offset the incredible amount of damage that production other materials has on the environment. Like the foam core, the epoxy resin used to coat the core is synthesized from petroleum. When painted on over fiberglass, it creates a watertight and pressure resistant seal that protects the board. The fiberglass is composed of silica or silicate, which is often harvested from naturally occurring quartz, as well as epoxy or other petroleum derived additives. Typically, the materials are mass-produced at chemical factories: “shapers” or surfboard manufacturers receive large blocks of foam, sheets of fiberglass, and plastic tubs of epoxy in bulk. Materials used in shipping include plastic, cardboard, and, of course, more petroleum in shipping by trucks, freighters, and planes. Once these “raw” supplies arrive at shops, shapers use other tools in the production of boards including spray machines, electronic buffers, electronic scales, tape, sandpaper, disposable paintbrushes, squeegees, and protective equipment. Surfboard tools are often made of disposable materials, seeing as there is no way to recycle sandpaper once it has been used or clean paintbrushes that have come in contact with epoxy resin. The shipping and packing process of heavy and bulky petroleum materials deepens the cycle of using non-renewable materials in surfboard production. However, most consumers buy their surfboards directly from these local shapers, and typically pick up the board in their vehicle, cutting down on packaging materials and transportation materials between the manufacturer and the consumer. In terms of usage, surfboards combine human and tidal energy for propulsion, and require no materials except for maintenance. It’s rare for surfboards to be damaged beyond repair suddenly unless the board hasn’t been properly maintained or exposed to extreme surf conditions or constantly exposed to direct sunlight over a long period of time, which can weaken or break down the protective epoxy. Routine maintenance includes repairing dings with additional layers of epoxy resin and fiberglass as well as “waxing” the board. Applying a layer of wax to the top of the board allows the surfer to have greater traction between their feet and the board in the water and is incredibly important from a safety standpoint. Surfboard wax is typically quite inexpensive and consumers have a large variety in choices of wax. Organic, scented and colored waxes are available. All wax is made of some combination of wax, resin, and oil. Should the consumer take care in storage and minor repairs of their board, a board can last years depending on usage. It is not uncommon to see completely functional 20-30 year old boards still in use. Despite the best efforts of the user, boards will invariably delaminate over time from salt water damage or sun damage to the resin. Additionally, strong surf can simply “snap” a board beyond repair. However, many artists use these damaged boards as a canvas for decorative art or up cycle them in furniture design. Invariably, many boards do get simply discarded and sent to landfills. Unfortunately there is no way to reuse or chemically break down the materials in these boards, and they simply become garbage. Surfboards are overall an ecologically unfriendly product, made from unsustainable materials and practices, and it is unfair for surfers to complain about the health of the oceans they love when they are contributing to pollution every time they purchase a new board. Unfortunately, there isn’t a simple solution or alternative to this cycle, but a select few manufacturers have been turning to old technology with hollow wooden boards. The cost of these specialty boards is prohibitive toward many surfers and epoxy is still a part of this process. The future of surfing and the health of the ocean is dependent on developing a better process for producing surfboards, but process will always be difficult when consumers favor new chemical technologies that allow us to have lighter, more buoyant boards that are easier and more fun to ride at the fraction of the cost of traditional boards. Promoting Science at the University of York, York, UK, n.d. Web. 09 Dec. 2014. "Epoxy Surfboard Construction." Tactics. Tactics Board Shop, n.d. Web. 28 Oct. 2014. "How Products Are Made." How Polyurethane Is Made. Advameg. Web. 28 Oct. 2014. Mark, H. F. Encyclopedia of Polymer Science and Engineering. 2nd ed. New York: Wiley, 1985. Print. "Ocean Emergency." What’s In Your Board. Sustainable Surf, n.d. Web. 28 Oct. 2014. <http://wiyb.sustainablesurf.org/wp-content/uploads/2013/12/Plastic-Fantastic-Panel-1_OL.jpg>. "Plastic Fantastic." What’s In Your Board. Sustainable Surf, n.d. Web. 28 Oct. 2014. <http://wiyb.sustainablesurf.org/wp-content/uploads/2013/12/Plastic-Fantastic-Panel-1_OL.jpg>. "Polystyrene Foam Report." Earth Resource Foundation. N.p., n.d. Web. 09 Dec. 2014. <http://www.earthresource.org/campaigns/capp/capp-styrofoam.html>. "Production of Polystyrene." SBioInformatics. Web. 28 Oct. 2014. http://www.sbioinformatics.com/design_thesis/Polystyrene/polystyrene_Methods-2520of-2520Production.pdf. Schultz, Tobias. "The Surfboard Cradle to Grave Project." Web. 28 Oct. 2014. <http://best.berkeley.edu/~schultz/documents/The Surfboard Cradle-to-Grave.pdf>. "Surfboard Construction And Care." Harbour Surfboards. Harbour Surfboards, 2014. Web. 28 Oct. 2014. <http://harboursurfboards.com/surfboard-construction-care/>. Sustainable Surf. Web. 29 Oct. 2014. <http://sustainablesurf.org/projects/>. When you think about a surfboard, it seems simple in mind. A shaped, plastic board that you use to float on in the water, but when you get down to the details there is a whole web of energy behind creating the few materials that together form a surf board. Today’s surfboards are very energy intensive, employing many materials that are purely synthetically produced and environmentally hazardous. Surfing, a sport that is ironically dependent on a healthy and green planet, requires highly unsustainable products to perform. The major part of a surfboard is a material called polystyrene, also known as Styrofoam. While there is another type of material that could be used—urethane—this type of board has been phased out due to the harshness of toxins that its’ creation releases. (Powers) There are two ways in which to shape the Styrofoam for surfboards into bodies called ‘blanks’ (see figure 1). In the process of using extruded polystyrene, the manufacturer takes a large rectangle of Styrofoam and from there can take away what is not needed in order to form the shape of the blank. The other option is called expanded polystyrene-- taking a small compressed form of polystyrene and then expanding it into a mold to achieve the shape that you want. Between the two of these methods, the process of EPS, or expanded polystyrene, is more common as it is both more efficient and environmentally friendly. (Pirsch) The other process of extrusion generates unneeded amounts of waste and consumes more energy in terms of machinery used to cut the plastic, and also the human energy being used to help shape the blanks. Although the forming of the blank appears to be simple, the energy behind the material of polystyrene itself is very energy intensive. According to the Carnegie Mellon life-cycle Assessment, the total energy required to generate 1 million dollars’ worth of Styrofoam is equal to 21.1 terajoules. This assessment is a combination of the energy that the top 5 sectors use in order to process everything including: power generation and supply, polystyrene foam product manufacturing, plastics materials manufacturing, organic chemical manufacturing, and petrochemical manufacturing. These sectors are in addition to a variety of less energy intensive activities, such as the man-generated energy to process accounting and advertising. In addition to the energy required to create Styrofoam, there are also the requirements of transportation of the raw materials to the manufacturing site, which is amounted at .548 terajoules for rail, air, and truck transportation. (Economic) For comparison, in one hour a 60 watt lightbulb will burn 216000 joules; so to create 1 million dollars worth of Styrofoam you would have to burn 98.7 million 60 watt lightbulbs in an hour, and to only cover the energy required for transportation you would have to burn about 2.5million bulbs. The major issue with using Styrofoam as one of the main materials is that it’s difficult to get rid of. In many waste sites Styrofoam is not accepted as burning it generates human carcinogens in the form of benzene. This chemical is very pollutant and toxic to humans. (Polystyrene) Because of this, there is very little energy in the process of recycling Styrofoam, as you cannot burn it like many other things. Instead, most of the energy can be included in transporting the Styrofoam to landfills or water sites where they are simply left to sit as they are not biodegradable. Other minor materials that could be energy associated with surfboards are a variety of waxes that are used to maintain the surfboard. The usage of wax varies in accordance with the temperatures of the water the surfer will be encountering, but either natural or synthetic waxes can be used. (Power) Although there is this wide scope of options for waxes, there are only two consistent ingredients- paraffin for synthetic wax, and beeswax for organic wax. Paraffin is a solid derived from petroleum and coal. Slack wax is the feedstock for paraffin, which is a byproduct from the refining of lubricating oil. Removing the oil from slack wax is what generates paraffin wax—accomplished through heating the wax and then mixing it with solvents that will separate the paraffin product from the oil from the slack wax. (Surfboard Wax) The embodied energy found here is mechanical, chemical, and thermal. As for beeswax, this kind of wax can be harvested by hand, using human energy to place the honeycombs into the required tools to extract the wax. (Kirsten) The melting can occur from either the heat of the sun or electrically generated. Creating beeswax is a not a very energy intensive process. After the creation of all of the materials required they are bought by either manufacturers of surfboards who generate completed boards and sell them to consumers, or the materials are bought by wholesalers and then retailers to sell to artisans or hobbyists who craft their boards by hand. One failure in research that arose was finding the links of transportation between these retailers, wholesalers, and consumers. Although the cost of energy of transportation is included in each materials overall estimated of embodied energy, we can assume that there is even more unaccounted for transportation such as the artisan driving to the store to buy the materials for a surfboard, or a consumer buying a completed version for a major provider. Furthermore there is even more energy burned by the consumers going off to use their surfboards—traveling from surf site to surf site. In addition to this unaccounted for energy required in transportation, the energy required by artisans to create their surfboards needs to be considered. On top of human energy that is expended to build the boards, electrical tools such as buffers to lay the wax on the board could be considered and saws in order to cut down extruded polystyrene. More energy can be found in recycling the actual completed surfboard as opposed to only the raw materials. . Although their lives can be extended through constant maintenance such as the repairing of ‘dings,’ surfboards have a generalized life of about 5 years. (Power) After this time period is over, surfboards can be taken in to professionals or hobbyists to be refurbished but many are thrown away. In the event of that, most boards end up in landfills as their materials are not biodegradable. The energy in repairing a surfboard is found in the human energy required to touch up the dings. The reparation of dings simply includes fixing the wholes or dents that are found on the board with the original materials—resin and fiberglass—so the embodied energy in reparation is already accounted for by examining the original materials energy consumption. Overall the process of generating, using, and maintaining a surfboard is very energy intensive. Essentially, petroleum is at the base of every material that is used in creating a surfboard. Being mostly synthetic, except for the natural materials of balsa wood and beeswax being used, each of the surfboards materials must be chemically crafted with petroleum as the only fuel to its creation. Being a board generated purely from petroleum, the current process for creating surfboards is not sustainable. "Polystyrene Fact Sheet." (n.d.): n. pag. The Way to Go. Harvard. Web. 8 Dec. 2014. <http://isites.harvard.edu/fs/docs/icb.topic967858.files/PolystyreneFactSheets.pdf>. Abstract:. "Sustainability of Wood in Construction." Sustainability of Timber, Wood and Bamboo in Construction (n.d.): n. pag. Glasgow University. Web. 8 Dec. 2014. "Environmentally Friendly Surfboards." - Beachapedia. N.p., n.d. Web. 08 Dec. 2014. Economic Input-Output Life Cycle Assessment. Carnegie Mellon University, n.d. Web. 08 Dec. 2014. <http://www.eiolca.net/>. “Epoxy Surfboard Construction.” Tactics. Tactics Board Shop, n.d. Web. 28 Oct. 2014. <http://www.tactics.com/info/epoxy-surfboard-construction>. Howarth, Jack. "Download PDFs." Energy Intensity and Environmental Analysis of Mechanical Recycling of Carbon Fibre Composite. Science Direct, n.d. Web. 08 Dec. 2014. Kirsten. "Solar Powered Beeswax Extractors." Milkwood. N.p., n.d. Web. 8 Dec. 2014. <http%3A%2F%2Fwww.milkwood.net%2F2013%2F07%2F01%2Fresearching-solar-powered-beeswax-extractors%2F>. "Paraffin Wax." Wikipedia. Wikimedia Foundation, 29 Nov. 2014. Web. 08 Dec. 2014. Pirsch, Steven. "How to Build Your First Surfboard." How to Build Your First Surfboard. N.p., n.d. Web. 08 Dec. 2014. Power, Nick. A Surfer’s Guide to Sustainability (n.d.): n. pag. Surfer Today. Web. 8 Dec. 2014. 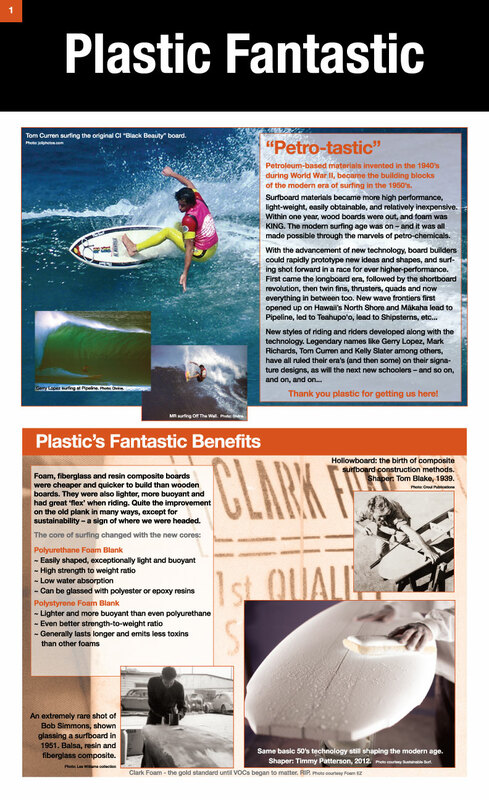 <http://www.surfertoday.com/images/docs/a%20surfers%20guide%20to%20sustainability.pdf>. "Surfboard Wax." Wikipedia. Wikimedia Foundation, 30 Nov. 2014. Web. 08 Dec. 2014. Tran-Bruni, Conchita. "Recycling of Cured Epoxy Resins." (n.d.): n. pag. - Cross-Linked Polymers. Plastics Engineering Dept, University of Lowell. Web. 08 Dec. 2014. Cowabunga! Surfboards are long, platform-like pieces of sporting equipment used to ride waves. Over 750,000 surfboards are manufactured each year . Originally carved out of wood, these once-sustainable products took a turn for the wasteful with the invention of the petroleum-based polystyrene foam core and fiberglass frame that is most common in the production of today’s surfboards. Many deem surfing, and the culture surrounding it, as green, sustainable, and close to nature. However, the manufacturing process of the surfboard proves otherwise. New insights into the production of surfboards have called surfers and entrepreneurs to action in creating less-wasteful surfboards, but the most common surfboards are made unsustainably. An analysis into the waste production life cycle of surfboards discloses ample evidence that this manufacturing process abuses the environment and the people that create, use, and repair the boards. Surfboards consist of a long, polystyrene core. This core is sandwiched between layers of thin fiberglass and sticky epoxy resin, which dries into a water-tight shell around the foam core. Balsa wood is used as decoration, and shows through the layers of fiberglass and resin. Petroleum is the raw material base behind polystyrene and resin, which are major parts of the surfboard composition. Petroleum is also a source of fuel, to fuel the machinery and factories that extract petroleum, and process it into polystyrene and resin. In petroleum acquisition, petroleum can leak into the surrounding environment through spills in water or on land. Petroleum can stay in soil, which can then affect animals or plants that come into contact with the soil. Petroleum can also sink deeper into the soil until it hits ground water, and can then contaminate water supplies. Also, petroleum gas can evaporate. When this gas is in the air, it becomes breathable and poses health risks for those working near petroleum. Workers at the rigs of petroleum wells, and workers in the factories, are both exposed to these health risks . Through the polystyrene and resin manufacturing processes, factories create non-biodegradable wastes, such as a sludge-like substance that forms on top of factory waste water reservoirs . Fiberglass, another component of the common surfboard, is a man-made product that rivals plastic in its strength and durability. The raw materials of fiberglass are silica or silicate, which are compounds that come from granite, quartz, and other minerals. These minerals are mined from sand deposits throughout the world. Environmental waste from mining includes gases released from burning fossil fuels, which fuel the machinery used for extraction at these sites. At the factory, studies have shown that workers exposed to crystallized silica are ten times more likely to suffer from autoimmune diseases than people who are not exposed . Balsa wood acquisition and processing is a fairly clean process. Waste from this process includes gas from burning fossil fuels used to power the machinery that cuts down the trees, the ovens that dry the wood, and the automobiles that transport the wood from the forest to the factory . Once the raw materials are collected and processed into polystyrene, resin, fiberglass, and consumer-ready balsa wood, these materials are used by artisans to create the surfboards. Although surfboards are crafted by hand, these artisanal shops produce waste, and the artisans do not bypass harmful factory conditions—even though they are working in a small shop. Artisans use tools such as sanders and saws to shape materials, and these tools require electrical energy . The waste from these tools, therefore, does not directly come from the shop, but comes from the byproducts of electricity power stations. These byproducts include ash, carbon dioxide, sulphur dioxide, and nitrous oxides, which are released into the air  . Workers shape and manipulate materials that can be harmful to humans. The foam and fiberglass must be sanded and shaped, creating particles that pollute the air. Also the liquid resin produces toxic fumes. Due to this abundance of unhealthy products in the air, sites of surfboard creation must be well-ventilated . Scraps and defective materials are not biodegradable, and must go to the landfill. In the global market, transportation accounts for huge sources of waste and pollutants into the environment. At each step of transportation, fossil fuels are burned to power the modes of transportation. Surfboards require even more transport—and create more waste—than a traditional, factory-made product. Rather than define transportation wastes as wastes produced during transport from raw material site to factory to store to consumer, surfboards contain extra steps in this process. Since surfboards are made artisanally and not in a factory, extra transportation is required to move the processed materials to the workshops where they are made, then to the retail stores where they are sold . Another form of waste in transportation is accidental spills. Accidental spills during industrial truck shipments are such a large problem, companies even implement specific infrastructure and marketing to bring up the loss of resin pellets, a non-biodegradable and toxic form of resin . Surfers use surfboards as a platform to glide against waves, thereby “riding” the waves. Much like other pieces of sporting equipment, surfboards do not need to be fueled, electrically or otherwise, for the user to experience the full use of the product. Therefore, the waste in this stage of the lifecycle does not come from the actual, intended use of the board. Instead, other surrounding factors create the waste in this stage. Since surfboards can only be used at specific locations (the ocean), the majority of users must transport themselves and their board to the proper site for use, so waste here comes from harmful gas emissions from burning fossil fuels . If an electric car is used, waste is still produced from the power station that produced the electricity. While the surfboard is in use, pieces of the fiberglass or resin can chip off into the ocean . Since surfboards are large and expensive, it is extremely common for surfers to maintain and repair their boards for years at a time, rather than purchase a new board. If, in repair, a user wishes to sand down a part of the board, this sanding results in unsafe particles released into the air. Other repair includes ding repair, resin applications, and wax application for easier use of the board . Repairs, like the construction of the board, are done by human power, but require the use of tools such as paint brushes, tables and work surfaces, and masks for inhalation safety. Each of these tools has its own waste life cycle, from the extraction of materials to the transport from factory to consumer. Once a surfboard has been outgrown, overused, or broken beyond consumer-done repairs, the owner can choose to recycle their surfboard, or dispose of it into a landfill. In surfboard recycling, a third party company will repair surfboards, and then resell them. This can be differentiated from user repair/maintenance, because the users are not repairing their own boards. Surfboards can also be repurposed for other uses, such as artwork, menu boards, or benches . In the recycling stage of the lifecycle, waste comes from the gas released from burning fossil fuels in transportation to and from recycling/repair sites. Also, each tool used to recycle or repurpose a board has its own set of wastes through its production life cycle, much like the tools used in user-maintenance. When a surfboard goes into a landfill, its components (fiberglass, resin, and polystyrene foam) do not biodegrade. Surfboards are just one of the many petroleum-based products at landfills. Due to this non-biodegradable trash, including surfboards, these landfills continue to grow. Studies have provided evidence that seepage from non-biodegradable waste at landfills contaminates the surrounding soil and groundwater with volatile organic compounds . Although surfboards are currently created in an unsustainable way that negatively affects the environment, surfers and manufacturers have began to look into better ways of recycling and creating more sustainable, environmentally-friendly boards. However, these steps have been quite small so far. Many of these surfboard recycling websites decline to give solid information on what kind of emissions and waste they are creating themselves, which makes it difficult to fully understand the waste creating at the step of reuse/recycling. Although some websites wanted very much to create new surfboards that were more eco-friendly, the majority of them did not go into the type of waste created from a single surfboard. This warranted study into the life-cycle of surfboards, particularly where waste is involved, will hopefully open the eyes of surfers who believe their sport is environmentally flawless. "Project Pangia." Project Pangia. N.p., n.d. Web. 09 Dec. 2014. "Epoxy Resin Systems." American Industrial Hygiene Association Journal 19.5 (1989): 444-45. California Department of Public Health. California Department of Public Health. Web. Watson, Rebecca. "Unsustainable Sand Mining in Sierra Leone." Enviro News. Enviro News, 30 July 2012. Web. 09 Dec. 2014. Baltek, Balsaholz, Hirnholz-Kernmaterial - 3AComposites Core Materials. AirexBaltekBanova, n.d. Web. 09 Dec. 2014. Bellman, David K. "Electric Generation Efficiency." Working Document of the NPC Global Oil & Gas Study (n.d.): n. pag. National Chemical and Petroleum. 18 July 2007. Web. 9 Dec. 2014. "The Sources and Solutions: Fossil Fuels." EPA.com. United States Environmental Protection Agency, n.d. Web. 07 Dec. 2014. "Safety and Environment." Blue Flash Express, LLC. Blue Flash Express, LLC, n.d. Web. 09 Dec. 2014. Schultz, Tobias C. "The Surfboard Cradle-to-Grave Project." Thesis. University of California, Berkeley, n.d. Print. "Surfboard Construction and Care." Harbour Surfboards. Harbour Surfboards, n.d. Web. 09 Dec. 2014. "Board Recycling." REDUCE / REUSE / RERIDE. ReRip, n.d. Web. 09 Dec. 2014. "Landfills, Municipal Solid Waste." EPA. Environmental Protection Agency, n.d. Web. 07 Dec. 2014. "Heavy Duty Industrial Epoxy and Urethane Coating Resin Systems." Epoxy.com Coatings. N.p., n.d. Web. 09 Dec. 2014. "An Introduction to Petroleum." Petroleum. N.p., n.d. Web. 07 Dec. 2014.